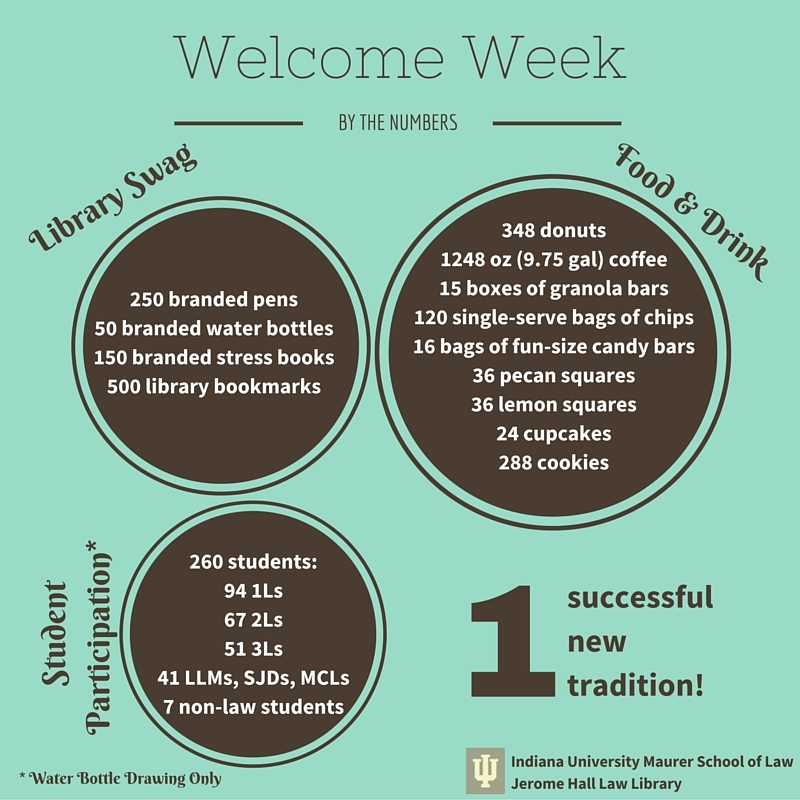 At the start of the school year, our library began a new tradition: Welcome Week. For three days, from 9 to 5, we took turns staffing a table in the library lobby with library swag, food, and coffee. I will admit, as the time for the event grew closer, I had occasional doubts about whether this event would be warmly received. In the end, however, none of us could have imagined just how successful this event would be! Lesson 1: Timing the event. We had to push our Welcome Week back a week later than planned because we didn’t account for how long the library swag would take to arrive. Ultimately this worked out in our favor due to other circumstances, but it could have been a mess had we already started advertising for the event. Lesson 3: Supplies, supplies, supplies. We were not nearly prepared enough on the first day for the number and types of supplies we would need, especially coffee supplies. All three days, we picked up travelers of coffee from the Starbucks down the street. These came with supplies, but students love coffee and evidently very few of our students take their coffee black! On the first day, we ran out of cups very quickly in our first morning rush, and one of the librarians had to run out for more, enduring a further barrage of texts from me to pick up other supplies such as cream and sweetener that were also quickly depleted. Be prepared. Lesson 4: The set-up. For the most part, the set up for the event went well, although you certainly have to account for it in timing the event. It was, however, glaringly obvious to all of us on the first day that we should have had a banner or large sign to hang on the front of the Welcome Week table. Although we advertised through many channels for a week leading up to the event, most of our questions on the first morning were, “What is this for?” For the second and third days, I created signs in Canva to hang on the table, but next year I’ll plan ahead. Lesson 5: When it comes to coffee and food, more is more. Each day of Welcome Week, librarians and staff contributed coffee and donuts in the morning, and sweet or savory snacks in the afternoon. On the first day, we brought in three Starbucks travelers of coffee and five dozen donuts. The donuts were gone in less than two hours, but the students were not, so we had to send someone out for four dozen more! 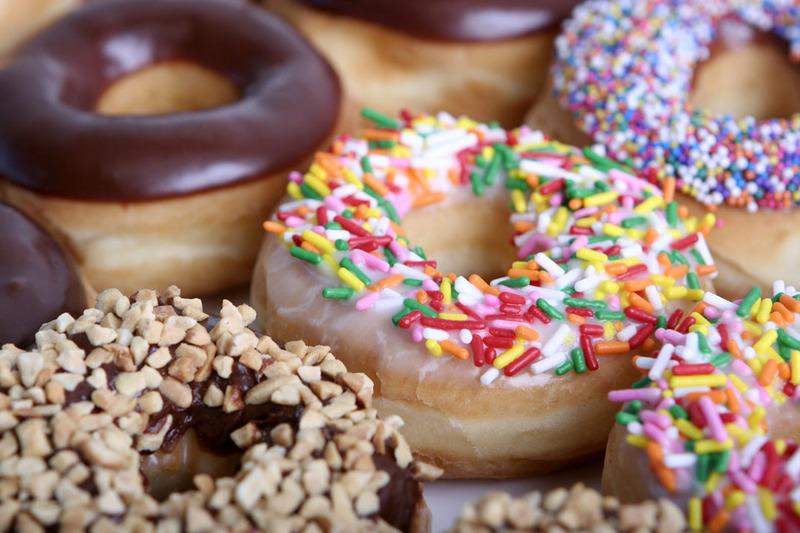 The coffee went quickly as well, but had to be ordered in advance, so for the second and third days we brought in ten dozen donuts and five travelers of coffee each day (which still went fairly quickly). Lesson 6: Ration the swag. Library swag is not cheap, so we had only limited quantities to give away. We decided ahead of time that pens and bookmarks could be given away for free because we had lots of them, but we put some parameters on awarding the remaining swag. We had hourly drawings for the water bottles, and students were asked library trivia questions to earn the stress books. Even with all of that planning, however, we gave away over half of the stress books on the first day, so we had to ration more strictly on the second and third days. Lesson 7: Some ideas just fail. After this year’s AALL Annual Meeting in Philly, several of us came away from the Thomson Reuters booth with selfie sticks, and we thought it would be fun to have students take library selfies for another chance at winning a water bottle (a separate drawing, where the pool of entries would likely be much smaller, and therefore, we thought, more enticing). Nope. Students got very excited thinking they could win a selfie stick, but when we told them the true intention, they pretty quickly shuffled away. The two students intrepid enough to take the sole Welcome Week selfie (at the persuasion of one of the librarians) were each rewarded with a water bottle. Overall, the event was more popular than we could have envisioned. While we can only estimate the total number of participants, 260 students put their names in the water bottle drawing alone, and there were certainly many who came for the food but didn’t bother with the swag. My favorite comment of all three days was during our very first rush: an upperclassman stopped by the table – coffee and donut in hand – and asked whether we had done this last year. We told him that no, this was a brand new tradition. He paused for a second, then said, “Well, this is a great tradition.” In the end, that was the best part of Welcome Week. Yes, it’s fun to give away free food and prizes and see grateful, happy students flooding the library, but many of them stuck around and had lengthy conversations with us, and it’s these connections that have been so meaningful to me. Yes, a great tradition indeed! This entry was posted in Marketing, Planning and tagged library events, student engagement, swag, welcome week. Bookmark the permalink.